Toilet cleaning is an important part of home cleaning, but it's also a challenging process. Not only does the process require a lot of work and effort, it also requires a little time and effort. The good news is that there are ways to make toilet cleaning easier and more efficient. So if you're having a hard time cleaning up your toilet then the following home toilet cleaning tips will make your job easier. Before we start discussing specific cleaning tips, we should first take the time to review the toilet cleaning process. 2. Lift up the toilet seat and start washing the rim. After that, apply your cleaning solution and then start scrubbing the entire area, including the parts underneath the rim. 3. Do the same for the bowl, and once you're done, pour some soap water into the bowl and let it soak there for a while. If you detect any unusual smells, apply some cleaning agents and keep scrubbing until the smell subsides. 4. Move on to the toilet tank. Read the instructions on your toilet's manual and follow its direction with regards to cleaning your toilet tank. If the manual is no longer available, however, then only scrub the sides of the toilet tank using a light soap-water solution. Strong chemicals can harm your toilet's parts. 5. After you're finished cleaning all of your toilet's parts, spray them with anti-bacterial spray. Leave them there an hour or so, and then rinse everything, including the bowl. This is how you clean your toilet. However, this process only covers the basics. 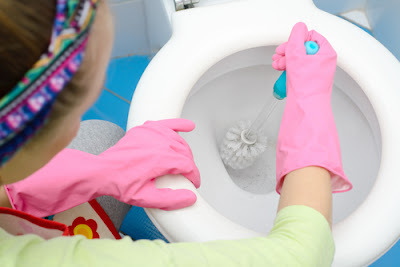 In order to thoroughly clean your toilet, eliminate the bad smells or make your work easier, you will need to do a few other things, and here are several tips to help you do it. 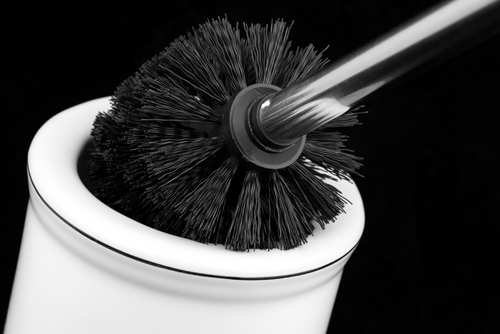 If you have a hard time using a toilet bowl brush then try to use other cleaning equipment like a squeegee or a sponge for example. If your toilet cleaning agents are too strong, experiment with vinegar or even organic cleaners to see if they can do the same job as your regular cleaning agents. If your brush can't reach certain parts of your toilet tank, get one that has rotating or adjustable components to deal with the problem. 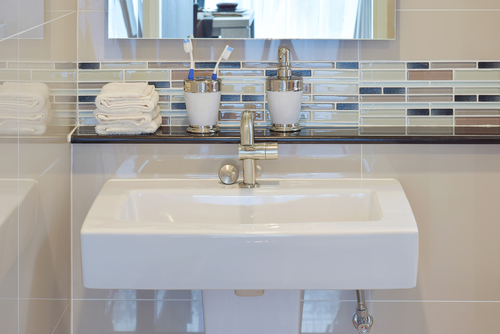 The grayish material at the base of your toilet is called a grout, which is a porous material that stains easily. It's also the part that is most likely to cause mold growth. The trouble is that cleaning the base of your toilet is not an easy thing to do, particularly with a regular brush or scrubber. So instead, you should use an old toothbrush to get the job done. To clean your toilet's grout, simply take the brush and dip it in whatever toilet cleaner you're using, or better yet, buy an actual grout cleaner and use that. Next, pour some water on the base of your toilet and make sure that all of the mold (if any) have been removed. Once everything is ready, just start scrubbing and cleaning. Once you're finish, simply rinse the base of your toilet and proceed with the rest of your work. Most toilet cleaning equipment consist of cleaning agents, a pair of gloves, a bowl brush and sometimes even a plunger. However, if you need to clean the insides of your toilet, you should get items like ball shaped plungers, sprayers, sponges, a mop and a good supply of absorbent materials, like newspapers or old toilets. This way, you'll have an easier time cleaning your toilet tank. Also, try to find your toilet's instruction manual, as it may offer some important guides on how to clean the toilet tank. For example, strong cleaning agents can potentially harm the internal components of your toilet tank, so look for information on which chemicals are bad for your toilet and which ones are not. You can't remove mold with your usual toilet cleaning items. To remove them, you will need to use a special cleaning agent. The good news is that you can find many such products on your local grocery store. If they're not available, however, you can always make your own by mixing a cup of bleach with a bucket full of water. Use this solution or an anti-mold cleaning agent to clear away the mold from your toilet. Don't forget to wear a mask and a pair of gloves when you apply them. On the other hand, if you're dealing with a toilet mold caulk, it's best to use pure vinegar and lemon juice. Take a toothbrush, soak it in the vinegar or lemon juice and then use it to remove the molds. Again, don't forget to wear gloves or a mask. There are a lot of home cleaning articles that recommend vinegar or vinegar solutions, and this is because vinegar is highly acidic. Acidic substances make very effective cleaning agents. So if you find yourself running out of toilet cleaner, take a little bit of vinegar (or any equally acidic substance), mix it with water and use that to continue cleaning your toilet. They are particularly effective against soap scum, but they can also be used to eliminate bacteria, stains and to a certain extent mold. Finally, you should allow fresh air to circulate in your toilet before and after you've cleaned it. Not only does this prevent the spread of mildew, it also helps to eliminate bad odors from staying in your toilet bowl and toilet tank. If, however, your bathroom doesn't offer a lot of ventilation then you may want to ventilate it with an electrical fan. It's not perfect, but doing so will help to eliminate the smell of mold, chemicals and waste products from your toilet.